Whether you’ve just entered the nutrition profession or consider yourself a seasoned veteran, it’s that exciting time of year again to celebrate you! From the staff of Today’s Dietitian, we’d like to say Happy National Nutrition Month and Registered Dietitian Day to all of you. Nutrition professionals across the country and abroad work tirelessly in private practice, hospitals, foodservice, and long term care facilities, and at food companies and government agencies to help clients and patients live healthier lives. In recognition of this special month, Today’s Dietitian brings you its fourth annual TD10 feature on page 32, which includes profiles of the top 10 RDs you helped nominate for the exceptional work they do in the dietetics field. We received more than 100 recommendations, and we want to thank you for taking the time to nominate your peers and giving them a chance to be recognized and serve as an inspiration to others. We hope you enjoy reading about the work they do that goes above and beyond the call of duty. 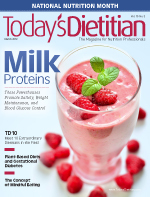 Our cover story, “Milk Proteins: Packing a Powerful Nutritional Punch,” looks at the evidence showing that Americans may not be getting enough high-quality proteins, namely milk proteins, in their diet for optimal health. Milk proteins improve muscle function and mobility, boost satiety, improve glycemic control, and help prevent certain chronic diseases. And guess who’s capitalizing on this research? Food manufacturers. They’re fortifying dairy foods and other products, such as yogurt, cheese, and beverages, with milk proteins to boost their products’ nutritional value and enhance consumer appeal. We tell you about these products and the foods that naturally contain high-quality proteins so you can inform clients. Also in this special issue in the article “Mindful Eating,” a concept that encourages you to focus on the taste, texture, and smell of food to experience every facet of the eating process. Share your comments about this month’s articles on our Facebook and Twitter pages. Congratulate yourselves for all the hard work you do, and please enjoy the issue!